the clublike organ bearing basidiospores. A cell or spore-bearing organ usually club-shaped that is characteristic of the Basidiomycota. It bears basidiospores externally after karyogamy and meiosis. It is composed of a swollen terminal cell situated on a slender stalk, and gives rise to slender filaments (sterigmata), usually four in number, from the ends of which the basidiospores are developed. /ba·sid·i·um/ (bah-sid´e-um) pl. basi´dia [L.] the club-shaped organ bearing the spores of Basidiomycotina. A club-shaped organ of sexual reproduction in basidiomycetes (fungi), which has 4 (less commonly, 8) haploid basidiospores at its tip. A cell or spore-bearing organ, usually club shaped, that is characteristic of the Basidiomycota. It bears basidiospores externally after karyogamy and meiosis. It is composed of a swollen terminal cell situated on a slender stalk, and gives rise to slender filaments (sterigmata), usually four in number, from the ends of which the basidiospores are developed. Fig. 63 Basidium . 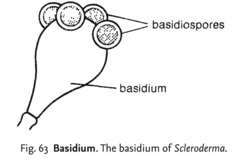 The basidium of Scleroderma. the (microscopic) structure on which the sexually produced basidiospores of BASIDIOMYCETE fungi are formed during sexual reproduction. pl. basidia [L.] the clublike fungal organ bearing basidiospores.